President Muhammadu Buhari on Wednesday night re-emphasised his administration’s zero-tolerance for corruption, vowing to hold members of his cabinet to the highest integrity standards. Buhari, while saying that he carefully selected his ministers by ensuring that only persons who passed integrity test made to his cabinet, vowed however to sack and prosecute any of his 36 ministers found culpable of any act of corruption. The president spoke during his maiden Presidential Media Chat which was broadcast live on television. Buhari said he was careful not to choose anyone that would embarrass his government on account of corruption as minister, saying that he would take responsibility for any of his ministers found wanting for corruption. He said, “I have been a democrat since April 2002. I don't think I picked anyone that will embarrass my government. But if you have got any evidence against any of my ministers, I accept responsibility for the 36 ministers that I have. “I don't think I picked anyone that has a case in court on corruption; tell me one out of the 36. I know that I have never appointed anyone that is in court for corruption. I don't think I would have deliberately made that kind of mistake. On the hope of rescuing the schoolgirls abducted in Chibok community of Borno State on April 15, 2014, it was not a particularly upbeat news from the president. According to him, there is no intelligence report to show if the girls were alive and in one place. Hundreds of captives have been freed in recent months as Nigeria’s military has driven the Islamic extremists into a northeastern forest enclave. But none of the girls abducted from a school in Chibok town were among them. Some Chibok leaders suggested last week that Buhari had “forgotten” their girls because he announced that Nigeria’s military has “technically won the war” against Boko Haram. They noted that Nigeria’s leader of seven months had said in the past that the war would not be won until the Chibok girls were rescued. Boko Haram has kidnapped thousands of people and the military said two weeks ago it had intelligence that the extremists were planning another mass abduction. The Chibok kidnappings brought international condemnation of Boko Haram and former President Goodluck Jonathan’s government and military for failing to save them. In an apparent response to the announcement of their defeat, the insurgents attacked the biggest city in the northeast, Maiduguri, with rocket-propelled grenades and multiple suicide bombings that killed about 50 people, and a double suicide bombing that killed 30 in a town 100 miles away over Sunday and Monday. “I am working with Niger, Cameroon and Chad. There is no firm intelligence where those girls physically are and in what conditions they are, but what we learnt from our intelligence is that they (terrorists) kept on shifting them around so that they are not taken by surprise and get freed. “And a whole lot of them are not in one place and we don't know how many divisions they (Boko Haram) have and where they are. There is no intelligence to say that the girls are alive and in one place. That is the honest truth,” the President said. He disclosed that some perceived leaders of Boko Haram wanted to negotiate with the Federal Government, adding, however, that the government insisted on establishing the true leaders of the sect before agreeing to negotiate the release of the girls and on what terms. “We want to ensure that they are complete; 209. Although some of the parents are rather desperate; they would rather see their (girls) graves than the conditions some of the children are reported to be in. “We are still keeping our options open, that if a credible leadership of the Boko Haram can be established and they tell us where those girls are, we are prepared to negotiate with them without any precondition. We have made this absolutely clear but while they are keeping the girls, they should not assume that we will not keep fighting,” Buhari said. 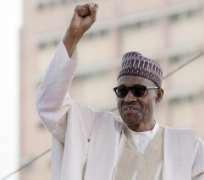 Boko Haram's “capacity to conventionally attack institutions, whether it is the police force or barracks as they used to, including Maiduguri, has been stopped,” Buhari said in a televised press conference on Wednesday, referring to one of the largest cities in the northeast, where the insurgency started. “But their use of improvised explosive devices has assumed a proportion that has virtually overwhelmed the government,” he said.